Sooke Road has been closed for hours due to downed trees that downed hydro wires. A community of 20,000 people literally cut off from medical services, transportation services, employment and loved ones. It looks like the Westshore Parkway gets you around that one, no? Yes there were various trees down that weren’t in areas without a detour. The road is now open or at least motorists can detour around the closures. One of my employees was late for his shift due to Highway 14 closures, and I'm sure he was one of hundreds. It's really not something that can be allowed to continue without improvement ... or at least efforts at improvement. We'll probably have a couple guys working from home tomorrow if the roads stay messy. We're set up for that, so it won't hurt us much, but for those who need to be in the office it's a PITA. Need to keep in mind people have to get home after the work day. With the forecast, more snow mid to later day anyone who has to go a long distance (to Langford for example) might want to either leave at noon or just stay home. Agreed. Unless you absolutely have to be out there stay off. Luckily all schools in districts 61-63 are closed today. That alone will remove a ton of traffic from the roads. They should have been closed on Friday as well. Yup. They sure are. I would imagine some private schools are open as well but that’s just a guess. pacific christian and st. margarets are closed. There are many more than those three. I can’t find info for some Montessori schools but I imagine they’re small enough that each parent can be contacted individually. well add glenlyon norfolk (closed today) and that’s probably 95% of private students in the region. Edited by Victoria Watcher, 11 February 2019 - 07:46 AM. Highway 14 is closed between roughly Jordan River and Port Renfrew due to downed trees. 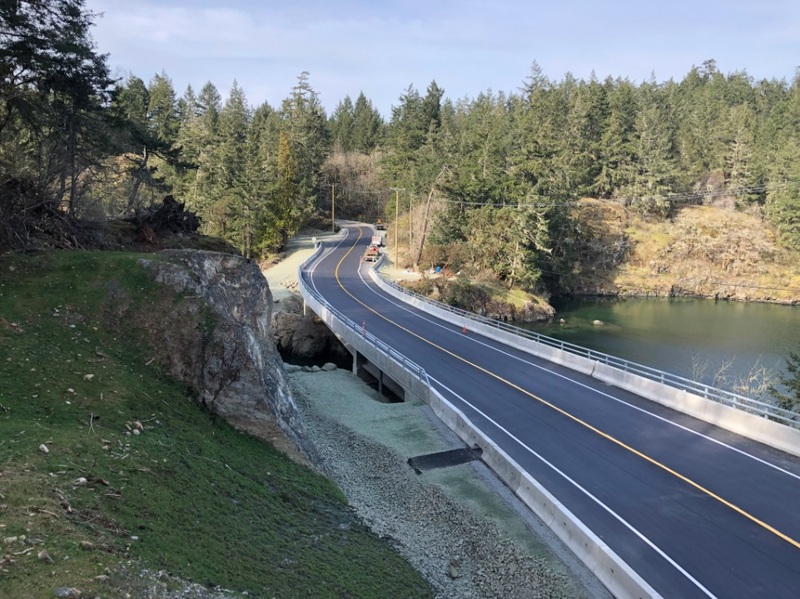 Transit users travelling through the western communities will soon enjoy a faster commute as work begins on a new bus-queue jump lane at Jacklin Road and Highway 14/Sooke Road. The eastbound bus-queue lane will start roughly 100 metres before the intersection and will allow transit buses to bypass congestion and traffic build-up from the intersection. The lane will continue after the intersection along Highway 14, before buses will merge back with the flow of traffic. The project will also reconfigure the intersection of Jacklin Road and Highway 14 to improve safety and sight lines, along with increasing the left-hand turning lane capacity from Highway 14 onto Jacklin Road. In order to complete the work, crews will rebuild the sidewalk on the north side of Highway 14 and install a new BC Transit bus stop. The work will begin during the week of March 11 and is expected to be completed by summer 2019. The project, expected to cost approximately $2 million, is part of a suite of upgrades for the Highway 14 corridor. In January 2018, the Province announced a series of improvements to make the highway safer and more efficient for drivers, transit users, cyclists and pedestrians. This work aligns with the ongoing South Island Transportation Strategy. Launched earlier this year by the ministry, the strategy is designed to take a complete, comprehensive and co-ordinated approach towards improving traffic flow and congestion issues on southern Vancouver Island. I didn't realize Highway 14 at Jacklin Road looked so much like Douglas at Finlayson. 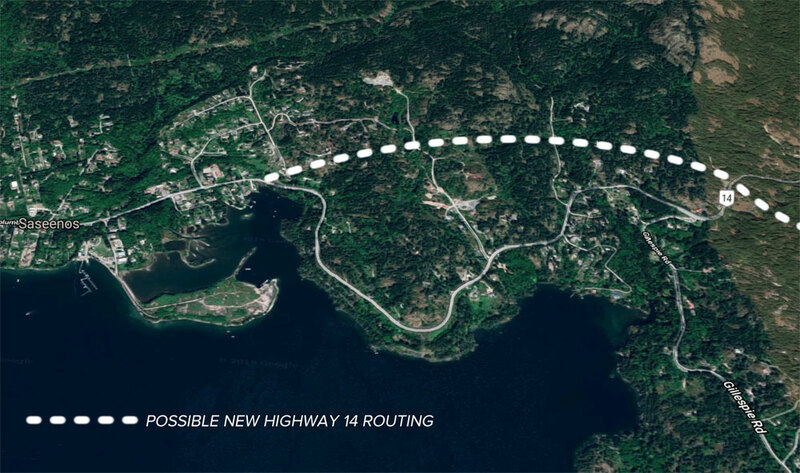 A loosely identified re-route option for Sooke Road/Highway 14 between the 17 Mile Pub and the community of Saseenos in Sooke. The province has begun engagements with landowners who may be affected by future upgrades and re-alignments of the busy corridor. The option running through the Sooke Hills Regional Park Preserve might ruffle a feather or two. How much higher altitude are we talking for a further north route that it would significantly introduce 'winter driving conditions'? Is there that much more snow and ice just a bit further north/higher? Yes, it would break beyond the 200m threshold along portions of that route. If you head up into the Sooke Hills in the winter you'd be surprised where and how often you'll encounter snow. 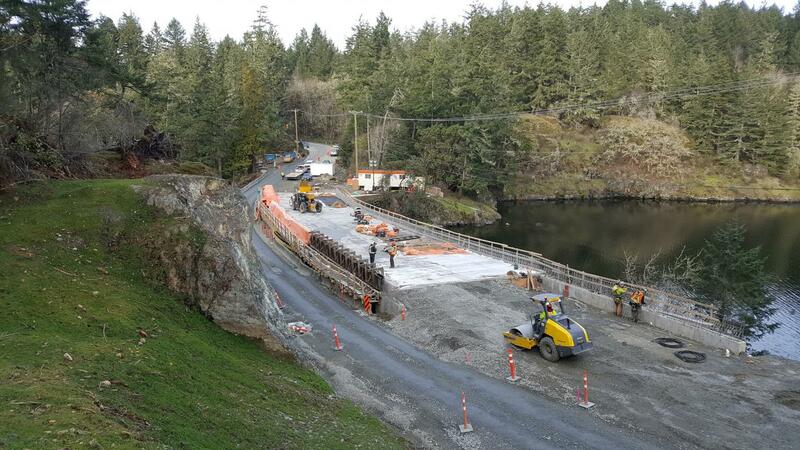 It's been complete for a while now, but the MoTI has some nice pics of the new Roche Cove bridge. Quite the improvement here.